This morning’s watering and romp around the garden with the squirrel hunting posse of labradorian descent gave me lots to think about. As our days are getting longer and warmer, some of the fall stuff must go to make room for the new spring crops. The brussels sprouts have made it clear to me they need to go so they’ll be on the plate this weekend. And so the collards must go too. They are on the verge of flowering and my guess is if I let that carry on much longer, the plant will be inedible. Then again, who knows? 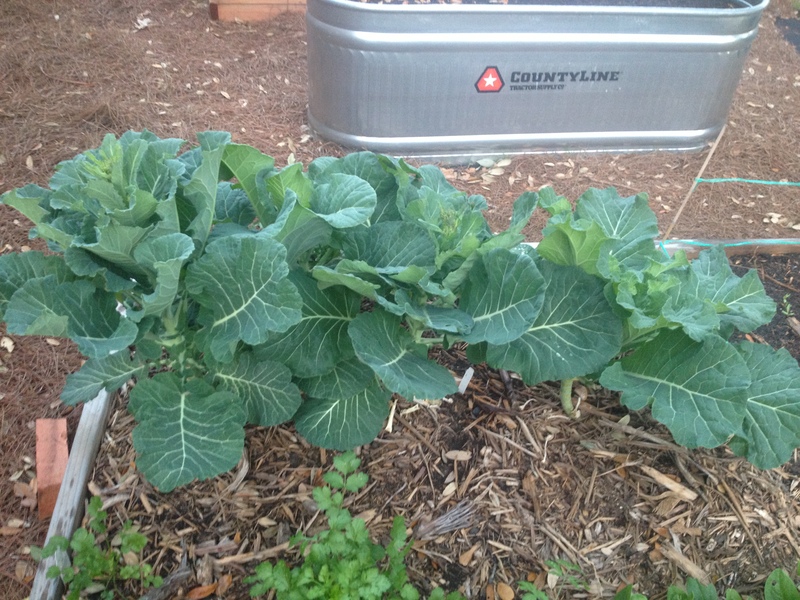 I never really ate collard greens much until I started growing them. And they rewarded me by being easy and providing lots of good eating! So bye bye collards! You have grown well and provided us with plenty of vitamins, tons of fibre, and lovely greenness. But you’re at the end of your life cycle and it’s time for you to make room for new veg. Maybe the zucchini will go here. Or some lovely peppers. Not sure yet. For now we salute you and bid you adieu. We’ll grow more of you next fall. Our salads these days are mostly spinach, arugula, kale and chard. A deep green and very tasty mixture that holds up pretty well even if you dress it in the morning before work. 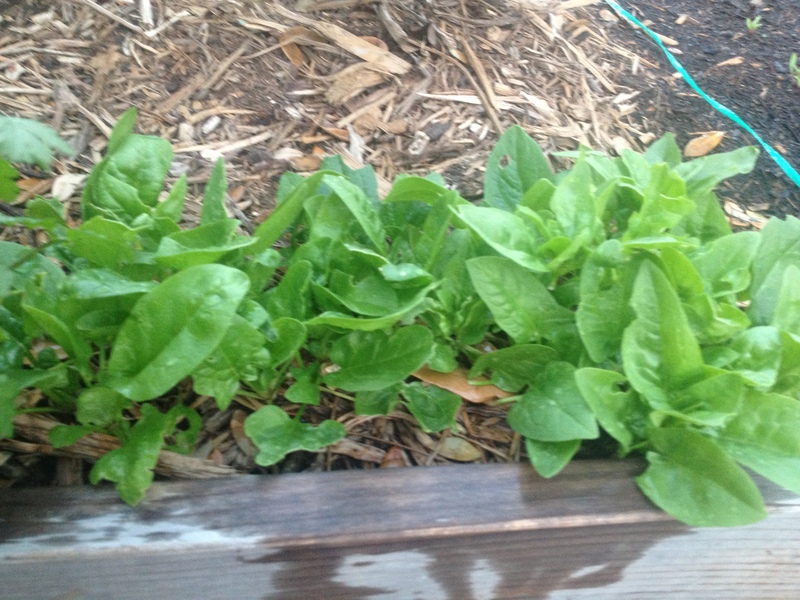 But I’m starting to dream of the other lettuces that are sprouting up. 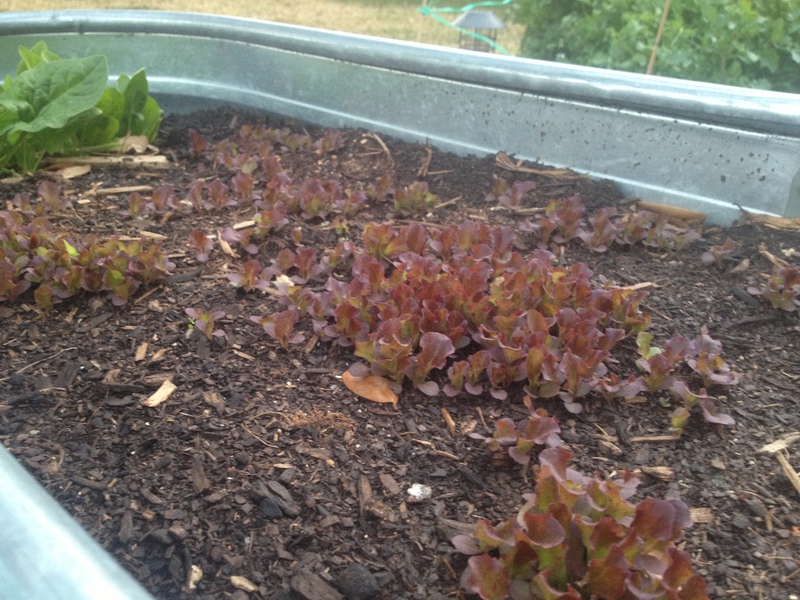 The red velvet lettuce looks really pretty in its small state. It’s going to be just gorgeous when it’s bigger. The snow peas are bigger than the English ones. 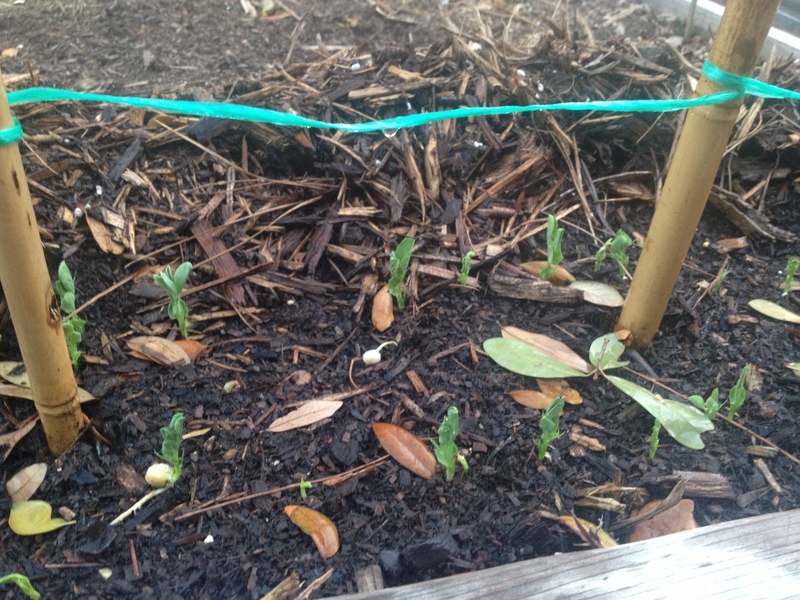 I took shots from two views so you could see how cute the little pea shoots are. 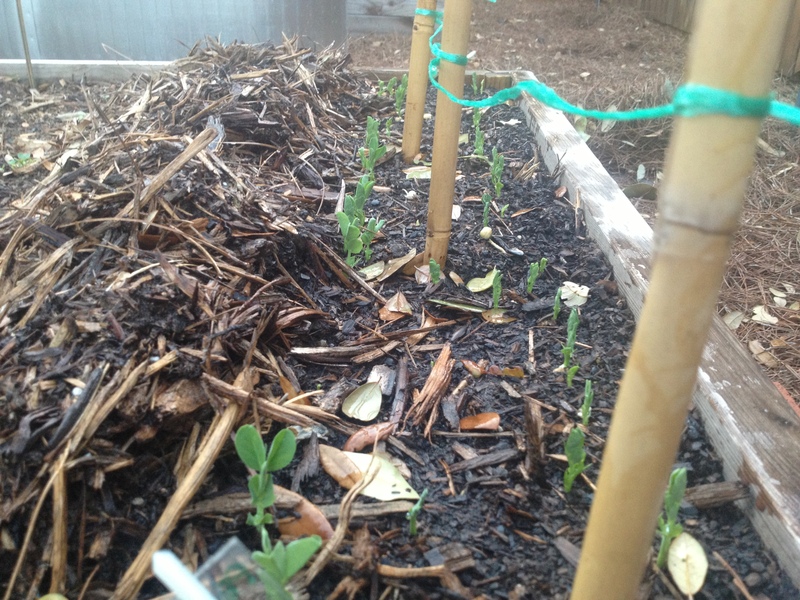 I’m excited to see how big they get—and I can’t wait to pick the peas. They are reminding me that I can get pole beans in the ground starting now. If I can find the space, that is…oh wait, maybe they can go where the collards were. This morning, my 4 legged “helpers” chased each other around the raised beds and hunted squirrels (don’t worry no woodland creatures were harmed) while I watered. Bruce is considering putting up a low fence (2′ high maybe) around the farm to keep the straw mulch in and keep sunbathing hounds out because I’ve found a couple of holes where snouts may have pushed their way into the dirt. And George keeps trying to sneak digs. He has a nice hole started on the opposite side of the yard. And when I yelled at him to stop, Godiva started sulking. 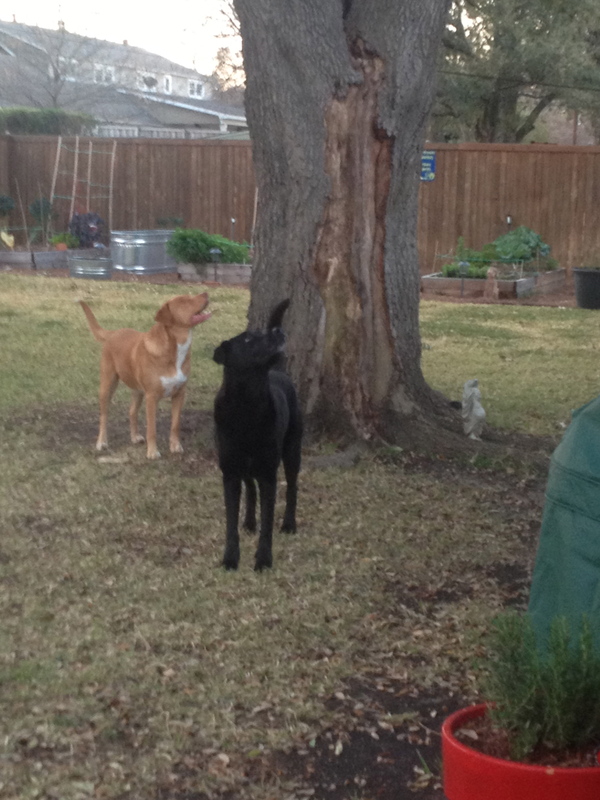 Maybe she’s thinking he should help us expand the Urban Farm. This entry was posted in Sow and tagged 3G Network, bruce, collards, garden, gardening, George, Guinness, harvest, Kale, Labrador Retriever, lettuce, Mortroski Midcentury Urban Farm, north Texas, peas, raised bed, sow, spinach, urban farm, water. Bookmark the permalink. You need to slice them up and sauté them. Maybe add a little panchetta or bacon if you like. Caramelize them and they will be your new favorite veg. Or slice and roast in the oven with a bit of garlic. Or just come over in the winter and I’ll fix you some. The Gs love Brussels sprouts btw. And I think Bruce forgot that he promised you part 2 with photos. I’ll remind him.